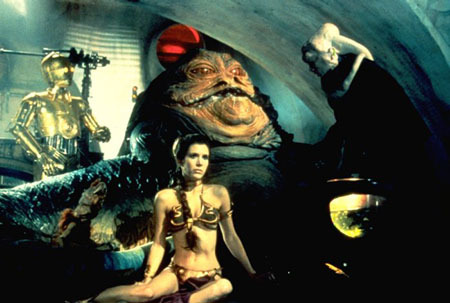 The thing about Princess Leia’s gold metal bikini is that everyone, Star Wars fan or not, knows what it is. It has become a pop culture mainstay. The leather-metal-cloth-chain ensemble has appeared at the Smithsonian and on sitcoms. It has been on action figures, limited-edition dolls for girls, and is available as a popular Halloween costume (88% polyester and 12% spandex) selling for around 50 bucks. 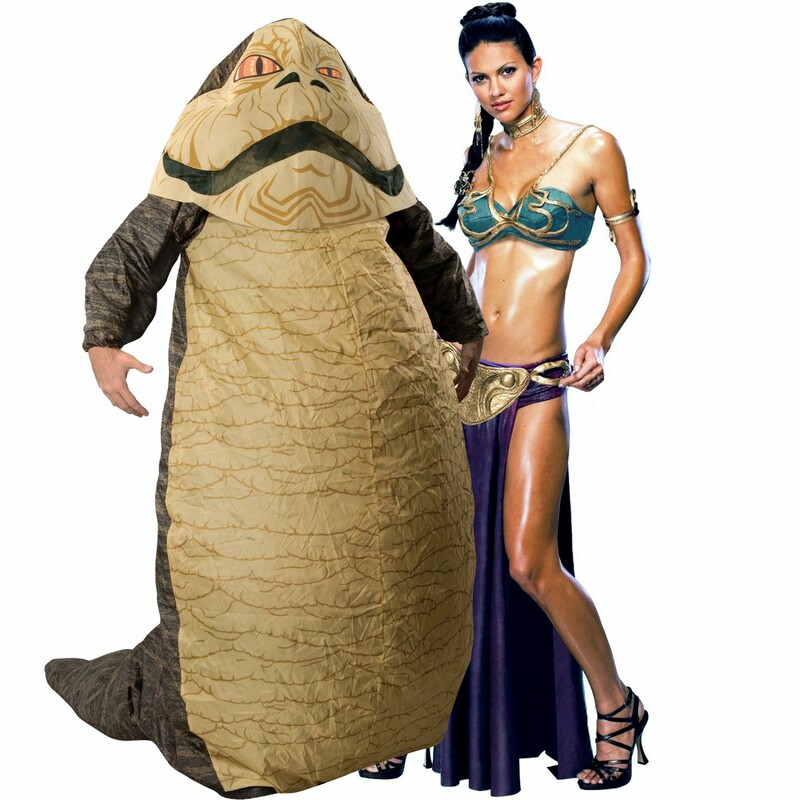 The creepy, papery Jabba is only available separately. 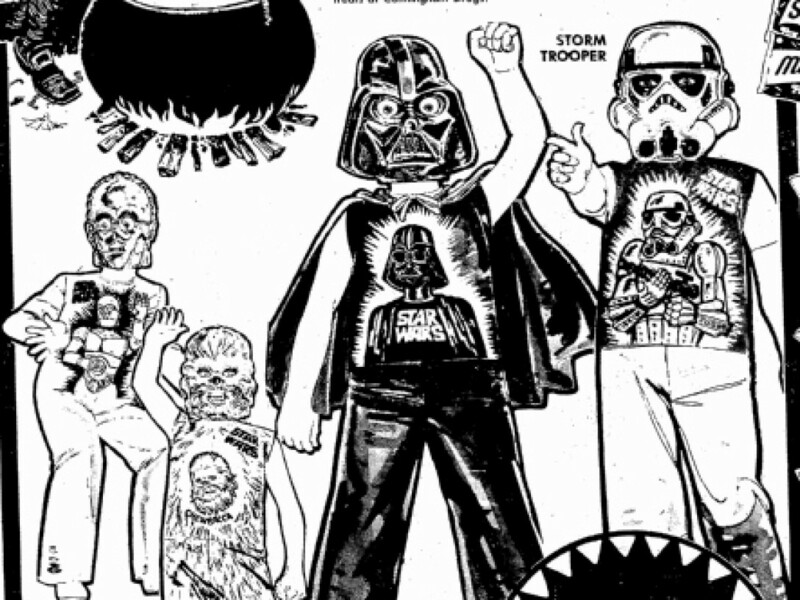 It is 30 years later and we are still obsessed with this costume, or lack thereof. Why? 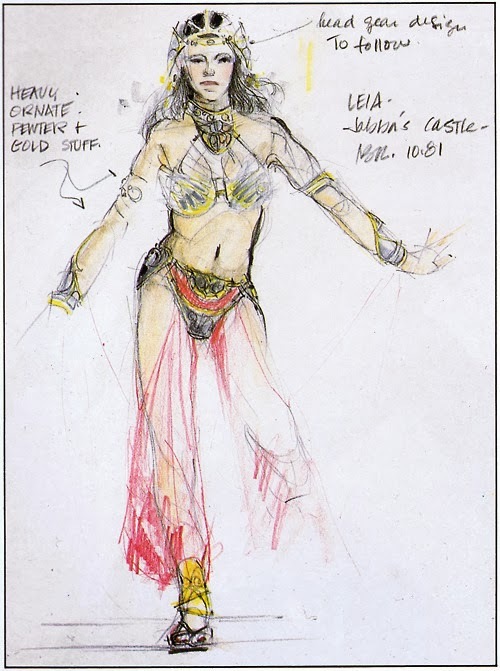 When we first saw Leia in that outfit, it was pretty shocking. It was supposed to be. 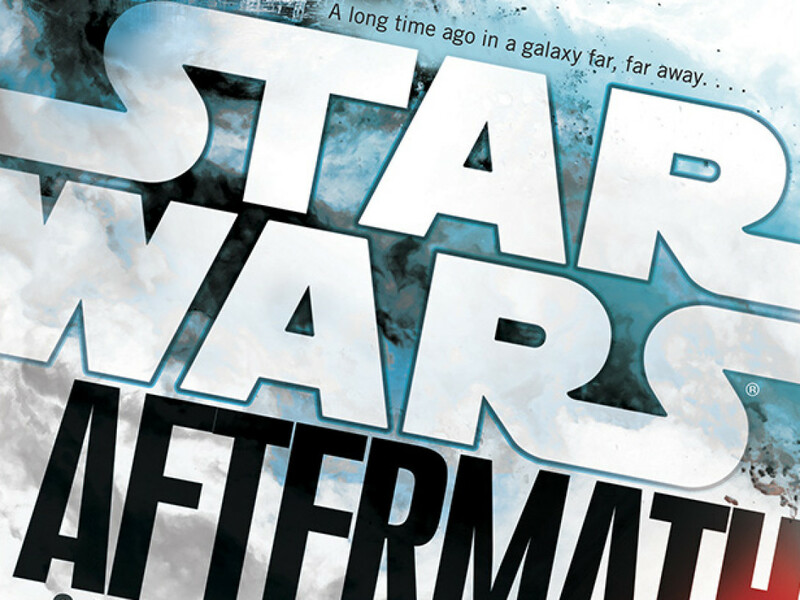 At the very beginning of Jedi, Leia frees the frozen Han, but is caught. 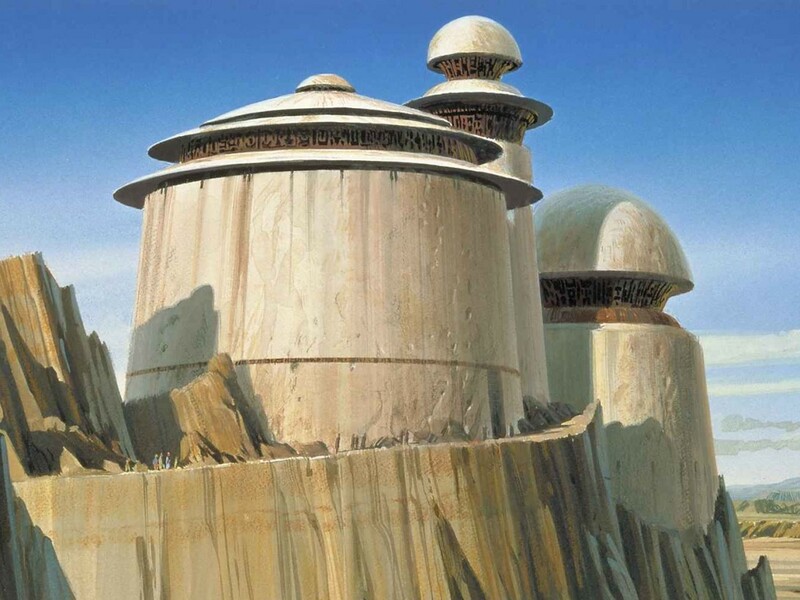 Jabba throws Han in a cell and condemns Leia to hang out in his dingy palace that looks like the basement of a frat house. The costume is demeaning because it’s supposed to be. It’s Jabba. What else should we expect from a gross crime lord who doesn’t wear clothes? But in fact, that bikini is part of a much deeper sci-fi/fantasy pedigree. On film, there is Raquel Welch’s fur version from 1966’s One Million Years B.C. Jane Fonda wore a silvery spacekini in Barbarella (1968). Comics like Flash Gordon also featured heroines who would mysteriously end up in two-piece outfits. And there are lots more. The design seems to hearken back to illustrations by the American artist Frank Frazetta for the 1970 version of the classic novel A Princess of Mars by Edgar Rice Burroughs. The woman in the picture is the Martian princess, Dejah Thoris, who is imprisoned by bad guys and rescued by John Carter. You can even see a little of Jabba in Woola, the animal she is riding. These princesses are in chains, literally, but they are prominent, strong images. Leis is shown in the same light. She may be chained to Jabba, but she acts stately, almost royal. Because when Luke shows up, he is not there to rescue her. He asks for “Captain Solo and the Wookiee,” not Leia. She’s always been strong. Han is the one who is helpless at that point. In fact, when Luke first sees Leia in chains, he doesn’t even bat a single, Jedi eyelash. When Jabba takes her captive, Lando just hangs out in a dark corner with his weird-teeth hat. No one is worried about her. Sitting in the audience, we are mesmerized by Leia, but terrified of what is happening to her. Her friends know better. When Leia finally escapes, she does it herself — using the chains to choke Jabba to a grim, rubbery death. When she emerges on the top of that sail barge, swinging a giant pike and shooting a blaster cannon, she is no longer a slave. 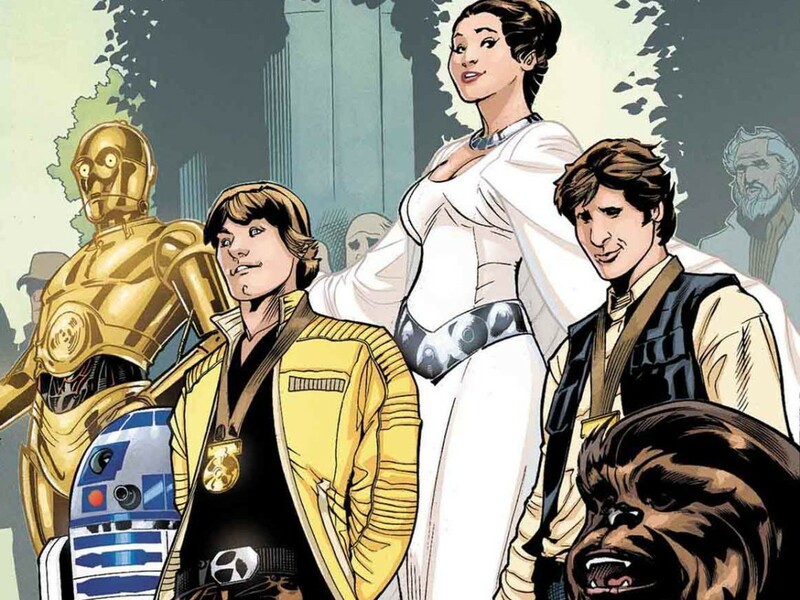 Because even though that gold bikini was first just OMG Leia in a gold bikini, it also quickly transformed into another image that we knew, somewhere in the back of our minds. In fact, the image of a female barbarian was well-known and popular from countless paperback sci-fi and adventure stories. The most famous female barbarian at the time was (and still is) Red Sonja, who debuted in the Conan the Barbarian comic book in February of 1973. 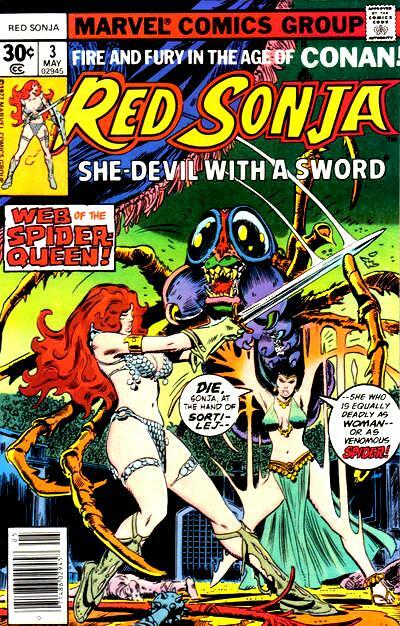 She had red hair, a giant sword, and wore (you know it) a metal bikini. She was so popular that women dressed up as her at early fan conventions. This is Wendy Pini, one of the first cosplayers of Red Sonja, here pictured on the Mike Douglas TV show in 1977. Wendy would later go on to co-create the very successful comic book Elfquest. 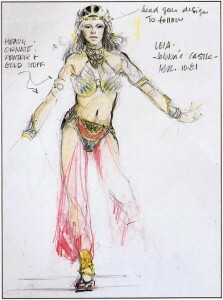 Do you think Red Sonja was in the pop culture air when they came up with Leia and her costume? Maybe. She was popular. 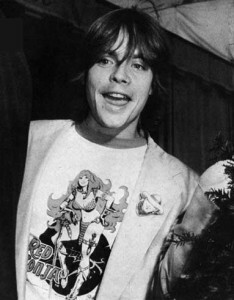 Even hip, new celebrities in the late seventies were wearing her image on t-shirts. Like this guy. On the various action figures, the official name for the outfit is “Jabba’s Prisoner,” but we have always called her “Slave Leia.” That is more appropriate, I think. The universe is not always a happy place. Just because there are Muppets in Jabba’s palace, doesn’t make it Sesame Street. When I was trying to write this piece, I kept getting drawn back to that first full shot. It hit me that when we first see her at Jabba’s feet (tail? ), she is the only human in the frame. Everything else is a puppet, a droid, or a prop. 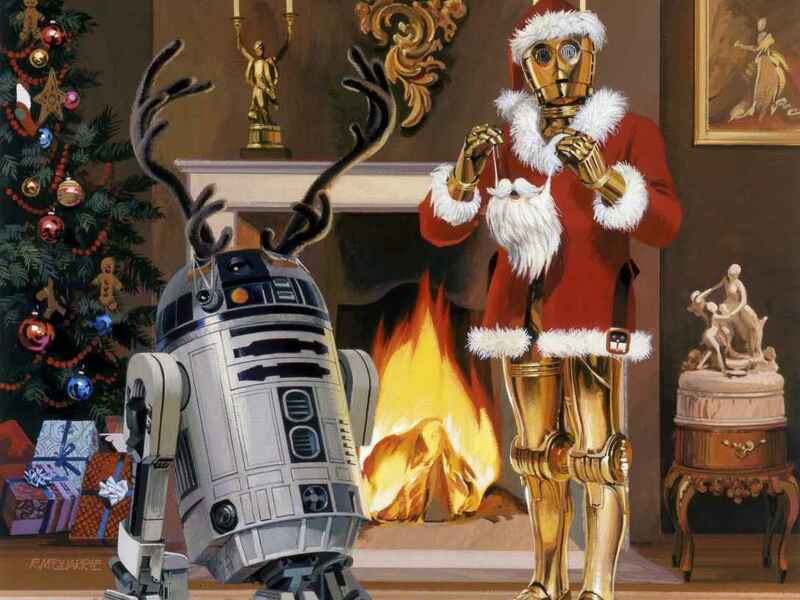 Nothing else is human; we don’t even know for sure if Salacious, Bib, or Jabba are even male! 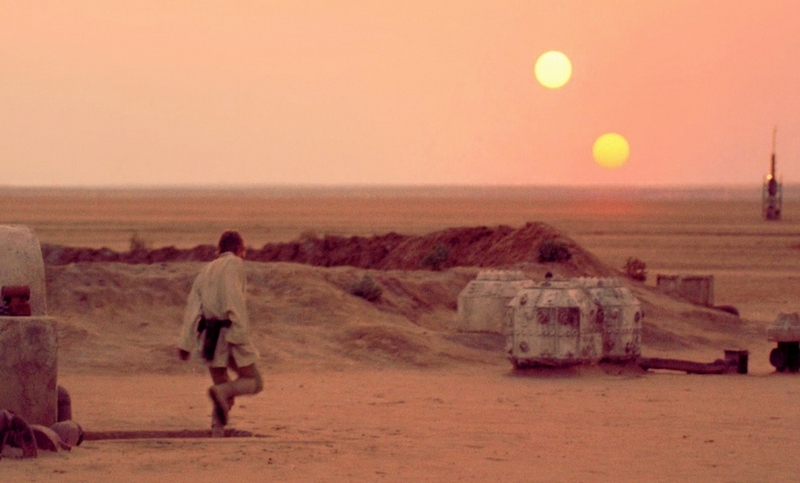 The only thing real in that shot is Leia — in the forefront of the frame and luminous. She has all the light. So why are we still so fascinated by the gold metal bikini? 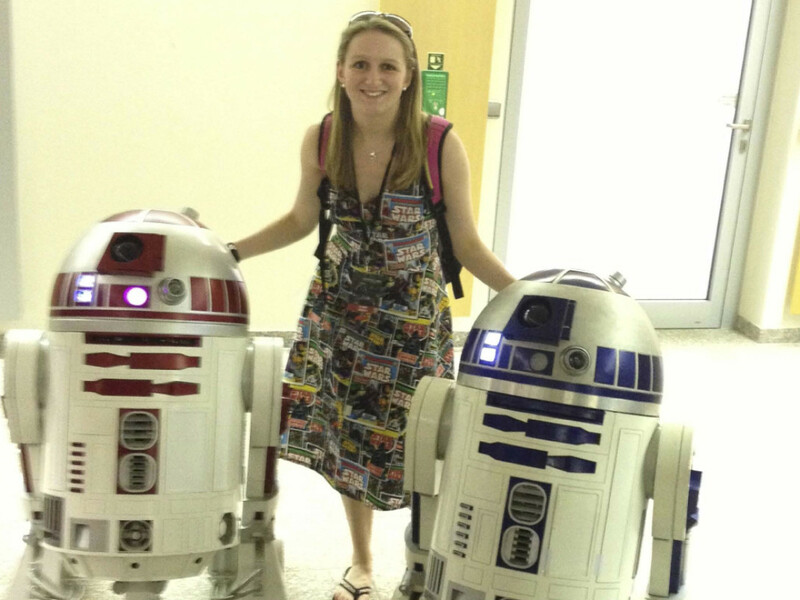 Why it is one of the most popular costumes for women at comic cons and festivals? Why do so many people strap themselves into this painful-looking thing that Carrie Fisher once called “what supermodels will eventually wear in the seventh ring of hell?” It isn’t the unforgiving nature of the costume that scares people, I think, but the unforgiving aspect — of Leia herself — that they wholly and fully embrace. There is a power in that. 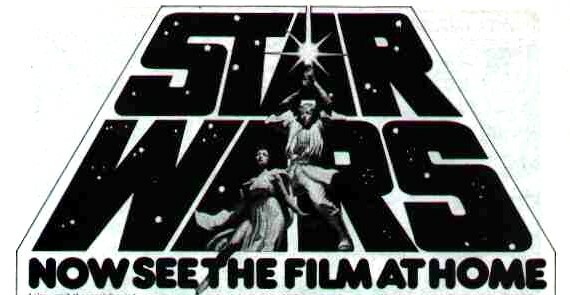 Luminous Beings Are We is a monthly column about Star Wars and popular culture by Brad Ricca, the author of Super Boys: The Amazing Adventures of Jerry Siegel & Joe Shuster – The Creators of Superman. He also writes the comics column “Unassuming Barber Shop” at The Beat. 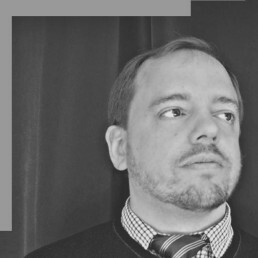 Visit www.brad-ricca.com and follow him on Twitter at @BradJRicca.